The applications and thus tablet usage in modern life is growing incredibly fast. As a result more tablets are used around us but guess what, a growing amount of thieves are lurking to steal these costly tablets. With the Gripzo tablet enclosure you are always one step ahead. Gripzo's Gorilla Grip secures tablets or smartphones when you’re not around. Note the unique twist with the Gripzo tablet enclosure, lock down and quick release is offered in a few seconds by authorised users keeping the tablet mobile and not locked in the enclosure ‘forever’. Lock down and quick release is done with a key just like you use to lock and unlock your home every day. Gripzo has already developed a new XL tablet enclosure for the latest iPad Pro 12,9”tablet. The Gripzo tablet enclosure has no electronics so no hassle with electronic keys, sensors, cables and adhesives, moreover …. no more false alarms, ain’t that sweet?! The tablet enclosure is opened by means of a mechanical key, remember, just like you do every day with your front door. How convenient is that? In case of lost keys or security breach, Gripzo offers replacement locks. Gripzo even offers non copy-able keys. Gripzo tablet enclosures can be used for multiple applications. Some examples. Tablets for sale on display need to be secured against theft otherwise they will be gone in a matter of minutes. The Gorilla grip tablet mounts are ideal for display security as the mounts keep the tablets accessible and well protected. Product experience is always possible if staff use the quick release option. 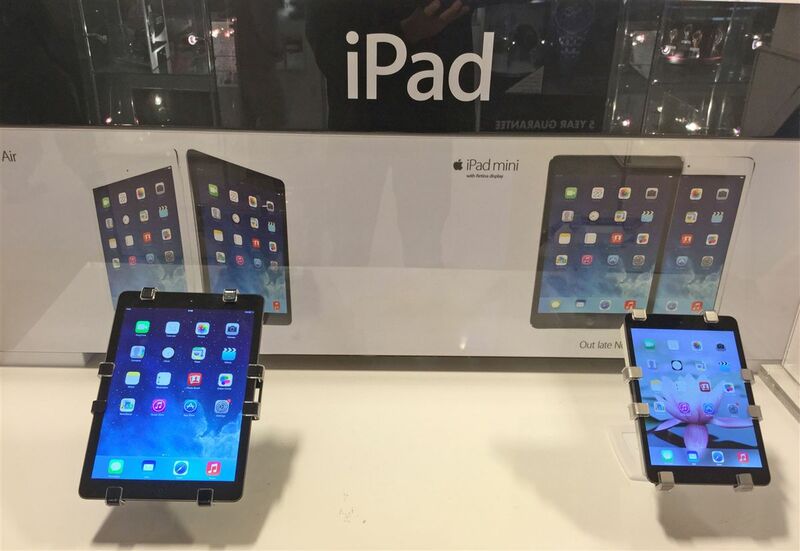 Tablets are more and more used for POS - point of sale in stores. Since POP UP stores are on the rise, tablets are used for payment in those environments. The security of the POS tablet is guaranteed in the POS grip for tablets. Quick lock down and quick release is easy using the mechanical security key keeping the tablet device mobile. The Gripzo POS grip offers landscape- and portrait turn but can also swivel from retail side to customer side making a second screen no longer necessary. People using tablets within offices is growing fast, but guess what, so is theft of those tablets! Staff should be more aware but should also be assisted with Gripzo tablet locks on their desks. Get the tablet lock grips today and train your staff to lock their tablets when they to go to a meeting or to the toilet. If you lock your car why not your tablet? Tablets are used nowadays for menus, cash registers, hospitality or other service requirements in restaurants, such as to call your waiter or ask for the bill. The Gorilla tablet grip is ideal, why not consider using this new security mount? It guarantees safekeeping of the tablets in your semi-public environment. Tablets are often used at trade shows. 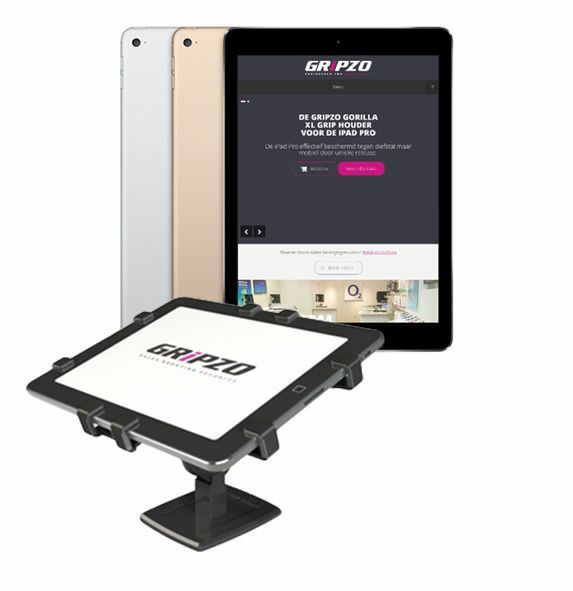 Gripzo’s iPad kiosk or tablet fixture make sure you can lock the tablet down but also release the tablet fast when needed. It’s as simple as locking and opening your front door with a key. Lock, release, present, with Gripzo security tablet holders. Gorilla Grips fit 95% of all modern smartphones and tablets. 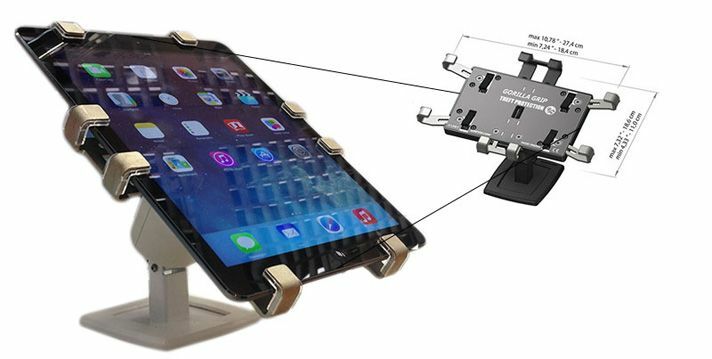 The security grips of the enclosure are adjustable making them fit for multiple tablet and smartphone sizes. Standard colours are black and white. Other colours are available with an MOQ. Custom made self-adhesives for retailers or Telco’s can easily be made by Gripzo against a small mock up. Fill out the form below to request more information about our products.